Helen Whelan and Harriet Palmer, New Zealand Tree Grower November 2018. Trichoderma are naturally occurring fungi which attach to and enter plant roots. Some Trichoderma can improve tree growth rates and disease resistance in nurseries and the forest, and have the potential to make a major contribution to the forest industry. Research includes identifying and isolating the most beneficial strains for radiata pine. Levy-funded research at the Lincoln University Bio-Protection Research Centre is making good progress and a series of plantation-scale trials were established on eight sites across New Zealand in early 2018. Trichoderma are fungi found living naturally in the soil and on roots of plants. They are endophytes, meaning they live within plants, forming symbiotic or mutually beneficial relationships with the plant. Research has shown that if the right beneficial Trichoderma fungi can be identified, isolated and applied to plantation crops, there will be long-term protection from disease as well as enhanced vigour and stress tolerance. The net result is improved crop growth and disease resistance of trees as well as horticultural and agricultural crops. Control pathogens by neutralising pathogens and by parasitising detrimental fungi. Research into the use of Trichoderma in New Zealand forestry was pre-empted by work in Malaysia by Dr Robert Hill of Lincoln Agritech Ltd. He is a world- leader in Trichoderma research and pioneered its use in nurseries in Sarawak. He developed a new bio- protection system for Acacia mangium, an important Malaysian forestry plantation species.The nurseries produce 30 million of these seedlings every year. Trichoderma strains were isolated from roots of a variety of healthy local plants and applied to seed trays. The most effective strains increased seedling height, stem diameter and dry weight, leading to a two-fold increase in productivity and reducing the growing cycle in the nursery by 20 per cent. This achieved one extra growing cycle each year. It has resulted in a change to the standard operating practice with the use of multiple fungicide spray cocktails replaced by a single inoculation at seeding.This meant increased productivity, increased environmental benefits and reduced costs in nurseries. Out in the field, the results were also significant with inoculated trees growing faster and taller, and producing a greater volume of wood. 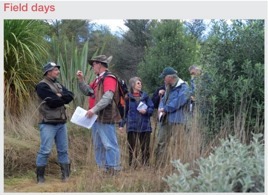 In 2012, Robert Hill began work to investigate ways of introducing Trichoderma to New Zealand’s radiata pine industry and the continuing work is led by Helen Whelan. 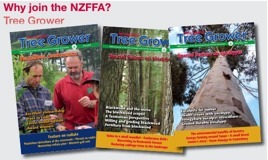 The research is funded by the Forest Growers Levy Trust and the Bio-Protection Research Centre working in partnership with Forest Growers Research and various New Zealand forestry companies. From the start the aim has been to produce radiata pine seedlings which are resistant to foliar disease and have significantly enhanced growth and improved health once they are planted out in the forest. A further aim is to reduce the use of chemicals in nurseries and plantations. then isolated from the roots of these healthy plants. The strains were then grown in the lab, applied to containerised radiata pine seedlings in nursery trials and screened to identify the most effective treatments for increasing seedling growth and health. Trichoderma formulations were also tested in potted seedling trials for their ability to protect the radiata pine seedlings against Diplodia pinea and terminal crook disease, both common nursery diseases which normally require chemical treatment. The most effective Trichoderma treatments significantly reduced the incidence and severity of infections caused by Diplodia, and also demonstrated potential for suppressing terminal crook, increasing the benefits of this biological treatment. The researchers then selected about 20 Trichoderma strains with superior growth promotion and disease suppression, grew the spores then mixed and dried them to form a powder. This powder was applied as a seed coating to radiata pine seeds which were grown into seedlings ready for planting out. From 2012 to 2015 the inoculated seedlings were planted in 19 small plantation trials in the Bay of Plenty,Waikato, Northland, Gisborne, Nelson, Whanganui and South Auckland. The trials have been closely monitored with very promising results. This year’s measurements show substantial tree growth benefits with increases of up between 15 and 20 per cent in tree height, diameter at breast height and health due to the seed coat treatments. eight large field trials planted – two each in Gisborne, Northland, Nelson and Bay of Plenty/Waikato. The trials ranged in size from two to three hectares. Generally, each region has a low and high-altitude trial site to represent the range of environmental conditions present in the region. The trials are evaluating the best two Trichodermaroot treatments selected from the existing smaller-scale forestry trials, again with the aim of improving resistance to pathogens and enhancing plant growth.The first height measurements will be taken next winter when the trees are one year old and further results will be collected. There are still many questions to be answered, including some around the persistence of Trichoderma in tree roots. High levels of persistence have been found in one of the inoculants in tree roots sampled three-and-a-half years after the inoculant was applied as a seed-coat. Samples from trial trees in six forests showed that 90 per cent of the root pieces still had the inoculant present. and molecular laboratory techniques are being used to see if there are differences in the species present. If large differences in the species mix are found, and current methods suggest this could be the case, these species could be used to treat seed specifically for warm or for cold locations. with faster growing trees and a significant reduction in chemical use in nurseries and plantations. In addition, trees inoculated withTrichoderma may also have resistance to new diseases not currently present in New Zealand but which may invade in the future. Many endophytic root Trichoderma are not very plant specific, so there is potential to transfer this bio- technology to other species such as Douglas-fir and cypress.The use of beneficial Trichoderma could then, in theory, reduce susceptibility to Swiss needle cast and cypress canker. Dr Helen Whelan leads the New Zealand forest industry harvest levy-funded research into Trichoderma at the Bio- Protection Research Centre at Lincoln University.